SwitchAir® part of the Geist Cool cooling solutions range is specifically designed to provide effective network switch cooling.. Due to high switch port density, placing network switches facing the rear of the rack is very common and simplifies network cabling. In this top-of-rack network switch deployment the heat typically exhausts out to the front or side of the rack. This can lead to mixing air streams and potentially failure of the network switch. 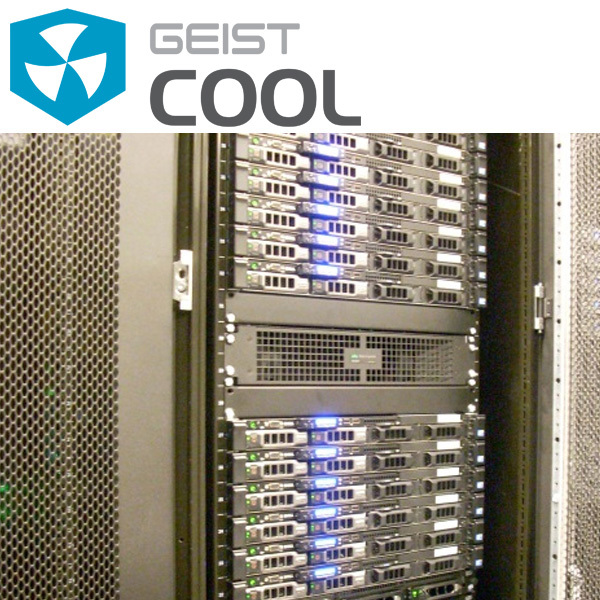 SwitchAir® part of the Geist Cool cooling solutions is specifically designed to provide effective network switch cooling.. Due to high switch port density, placing network switches facing the rear of the rack is very common and simplifies network cabling. In this top-of-rack network switch deployment the heat typically exhausts out to the front or side of the rack. This can lead to mixing air streams and potentially failure of the network switch. The SwitchAir® network switch cooling solution provides effective cool air delivery to top-of-rack front, side or rear intake network switches, whilst the warm network switch exhaust air migrates out of the rear of the rack. SwitchAir® installs into the front of the rack and delivers cool air to the network switch air intake. This installation is very easy and installs in minutes, and more importantly can be done while the network switch is operational. Once installed the network switch becomes effectively cooled with intake air temperatures stabilised to within a few degrees of the temperature at the front of the rack. There are various models of SwitchAir® available to ensure compatibility with a wide range of front, side and rear cooled network switches. Some models of SwitchAir® are active and are designed to draw cold air from the front of the rack, and deliver it the air intakes on the network switch via special side channels. Stack network switches with varying airflow patterns together. Quickly and easily retro-fit onto operational network switches. Effectively cool your network switch and stabilise your network switch intake air temperature to within a few degrees of the temperature at the front of the rack. Single input cord runs on any voltage and continually delivers required air.